How Does Cigarette Smoke Promote Pancreatic Tumor Development? Exposure to cigarette smoke activates stem cell features in pancreatic cells, via nicotinic cholinergic receptor signaling to transcription factors that activate expression of stem cell genes, researchers report in the September issue of Gastroenterology. 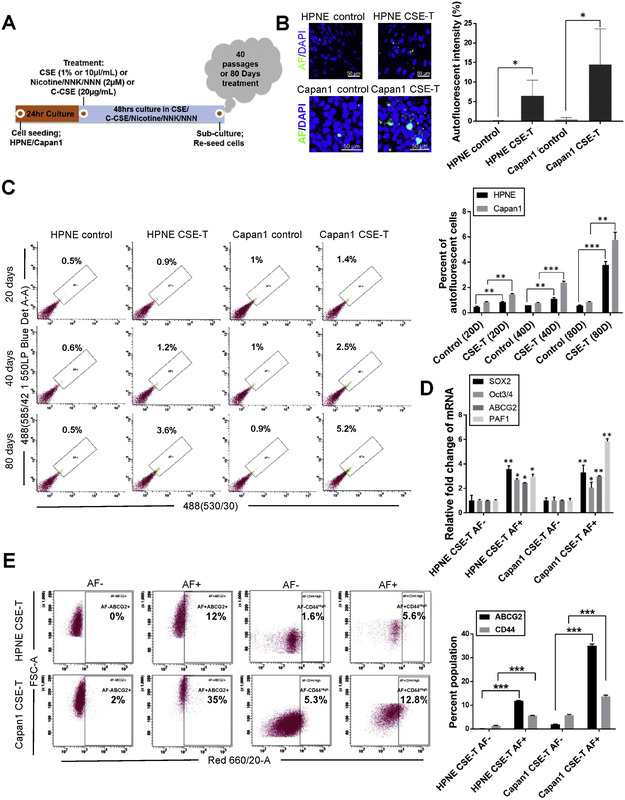 Levels of the stem cell transcriptional regulator PAF1 are increased in pancreatic tumors from humans and mice exposed to cigarette smoke. Levels of FOSL1 and PAF1 in human PDAC tissues (with and without smoking history) and in normal pancreas. Scale bar, 100 μm. Although there are several risk factors for pancreatic cancer, cigarette smoking has been reported to be responsible for 30% of all cases. However, it is not clear how cigarette smoke contributes to pancreatic tumor development or progression. Cigarette smoke contains more than 4000 chemicals, including nicotine and nicotine-derived carcinogens such as 4-(methyltyramine)-1-(3-pyridyl)-1-butanone (NNK) and N-Nitrosonornicotine (NNN). Cigarette smoke and its ingredients have been shown to increase the stem cell features of pancreatic cells. Stem cell features allow cancer cells to continuously self-renew and differentiate into multiple cell types. 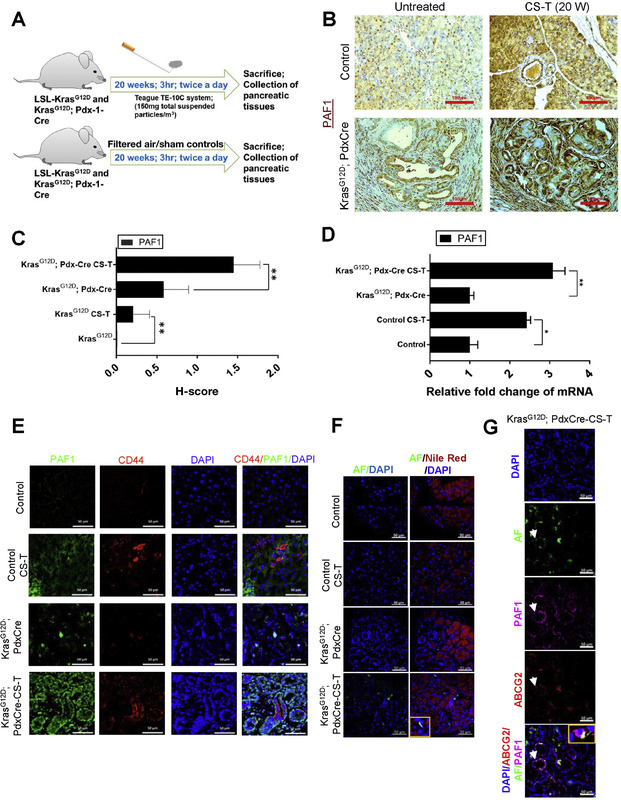 In mice, nicotine promotes initiation and progression of Kras-induced pancreatic cancer via GATA6-dependent de-differentiation of acinar cells, and nicotine has been proposed to activate pancreatic stem cells and acinar dedifferentiation. Rama Krishna Nimmakayala et al investigated whether chronic exposure to cigarette smoke and its ingredients (nicotine, NNN, and NNK), could enrich pancreatic stemness. They exposed KrasG12D; Pdx1-Cre mice to cigarette smoke or clean air (controls) for up to 20 weeks, and pancreatic cells (HPNE and Capan1 cells) to cigarette smoke extract, NNN, NNK, or clean air (controls) for 80 days. They found that exposure of pancreatic cells cigarette smoke extract increased expression of genes that are expressed by stem cells, inlcuding SOX2, PAF1, OCT3/4, ABCG2, and PAF1—as well as other stem cell features. These genes were also upregulated in pancreatic tissues of mice exposed to cigarette smoke, but not controls. Interestingly, PAF1-knockout mice and cells did not upregulate the other stem cell genes upon exposure to cigarette smoke. The authors concluded that smoking-mediated induction of pancreatic stem cell features is regulated by PAF1. How does cigarettte smoke induce expression of genes that activate stem cell features of pancreatic cells? Nimmakayala et al found that cigarette smoke induces expression of PAF1 via cholinergic receptor nicotinic alpha 7 subunit (CHRNA7) signaling to ERK and FOSL1. PAF1 then activates expression of the other stem cell regulatory genes. Pancreatic adenocarcinoma samples from patients had significantly higher levels of PAF1 and FOSL1, compared with normal pancreas (see figure). Also, levels of PAF1 and FOSL1 were increased in pancreatic tumor tissues from smokers compared to tumor tissues from nonsmokers. 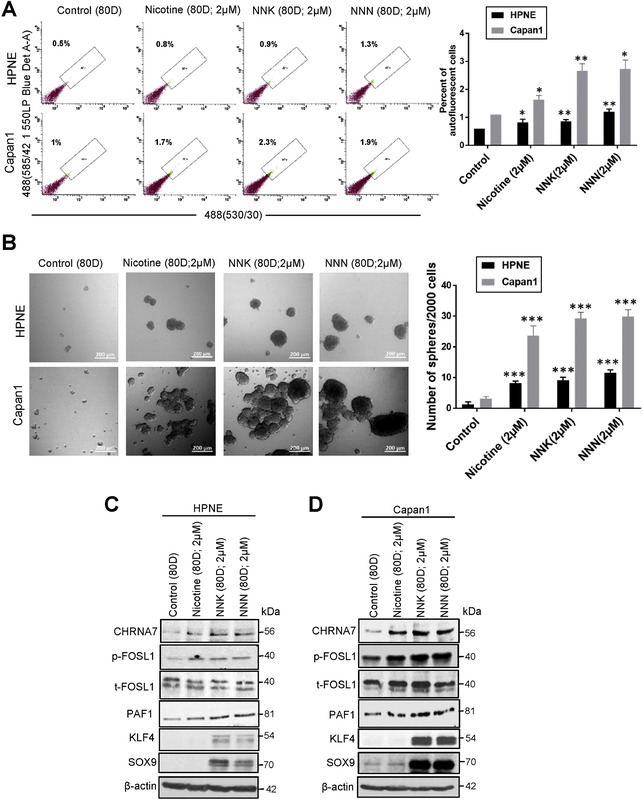 Incubation of pancreatic cells with NNK or NNN also increased protein levels of CHRNA7, FOSL1, and PAF1, similar to CSE exposure. Nimmakayala et al therefore proposed that NNK and NNN specifically contribute to cigarette smoke–induced pancreatic cell stemness vs PAF1. But how does PAF1 induce expression of the stem cell regulatory genes? 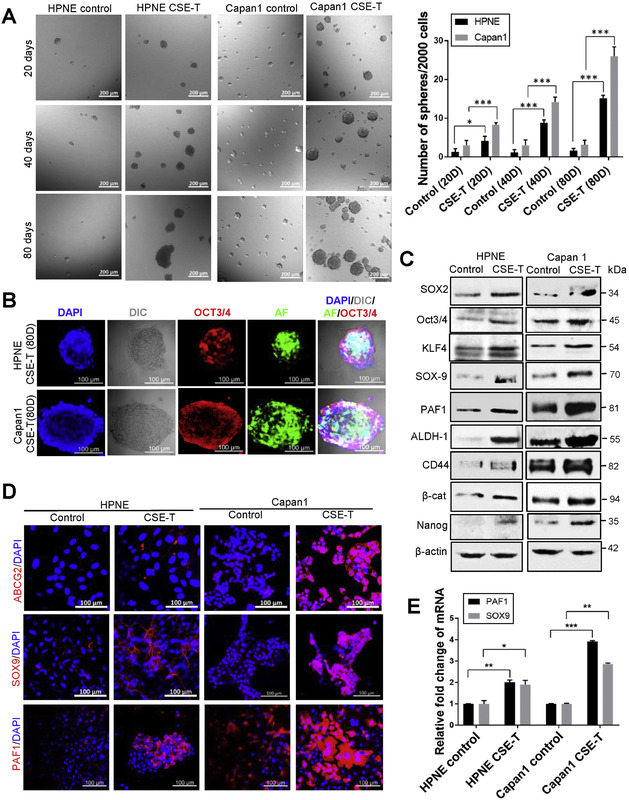 PHD-finger protein 5A (PHF5A) regulates self-renewal of embryonic stem cells. 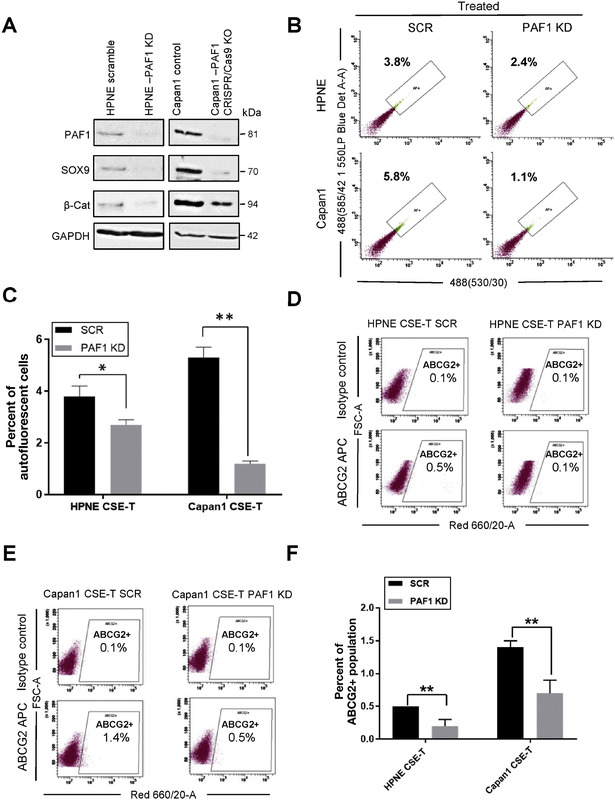 PAF1 interacts with PHF5A to activate expression more than 600 pluripotent genes, by regulating RNA polymerase II elongation in pluripotent loci. Nimmakayala et al observed colocalization of PAF1 and PHF5A in pancreatic tissues of cigarette smoke–exposed mice and in CSE-exposed cells. They propose that smoking increases the interaction between PAF1 and PHF5A—an event required for the activation of stemness genes. 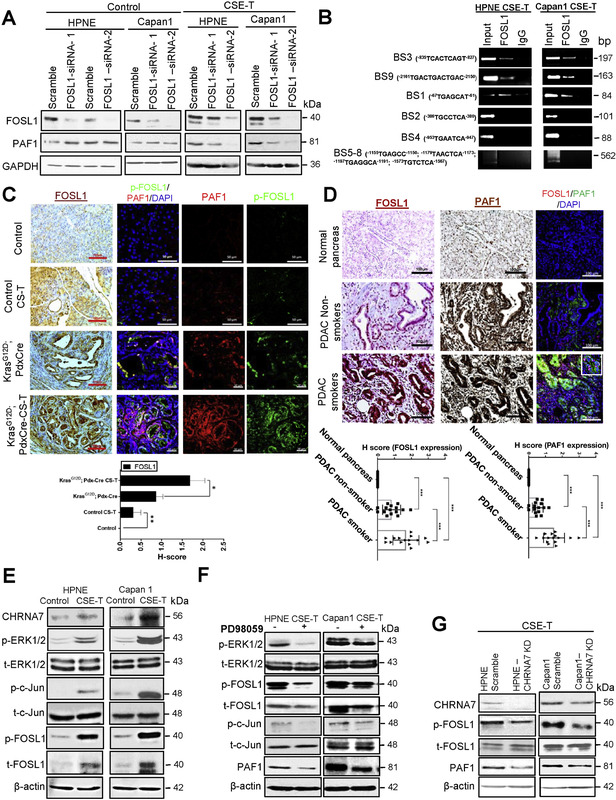 Nimmakayala et al conclude that exposure of human pancreatic ductal cells and cancer cells to cigarette smoke and its components induces stemness by increasing PAF1 via CHRNA7 signaling to ERK and FOSL1. 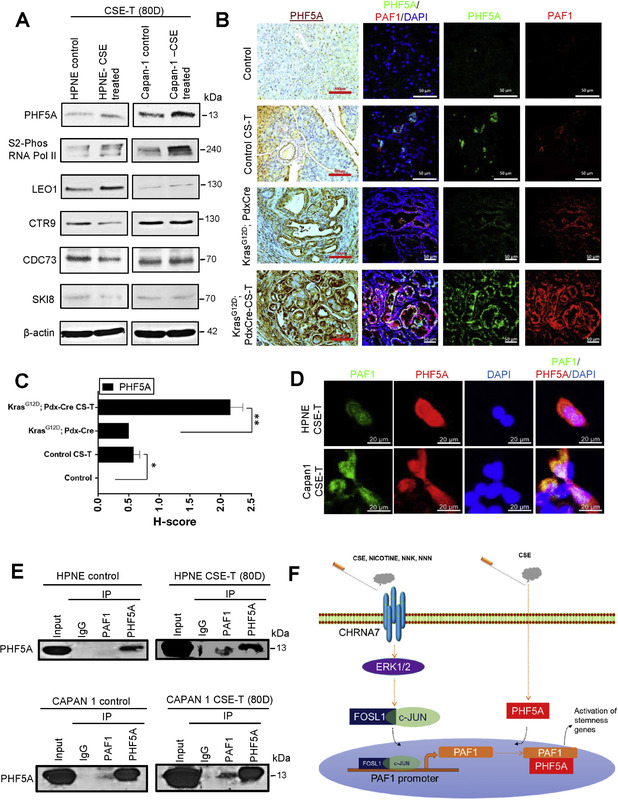 Cigarette smoke–induced PAF1 also interacts wtih PHF5A to activate genes that provide pancreatic cells with stem cell features required for tumorigenesis. Why do Pancreatic Tumor Cells Love the Liver?